Inspiration for décor can be found generally anywhere and usually the best inspiration comes when is encompasses an important meaning for our clients. Recently, we were asked to concentrate our design elements on two things: circles and squares. Now fortunately for us we have worked with these shapes in all different ways before but for this specific event we were challenged with “squaring the circle”. For the groom, an architect, this poses a mathematical representation. As I began to dig in and learn a little something about “squaring the circle”, I learned that the metaphorical significance implies impossibility! According to the mathematical representation, it is impossible to create a square with an area close to that of the circle using only a straight edge and a compass. Luckily for us, we had many other tools we could use to create this symbolic representation other than a straight edge and a compass. Every element of design for this ceremony was pre thought in order to satisfy the square and circle obligations. 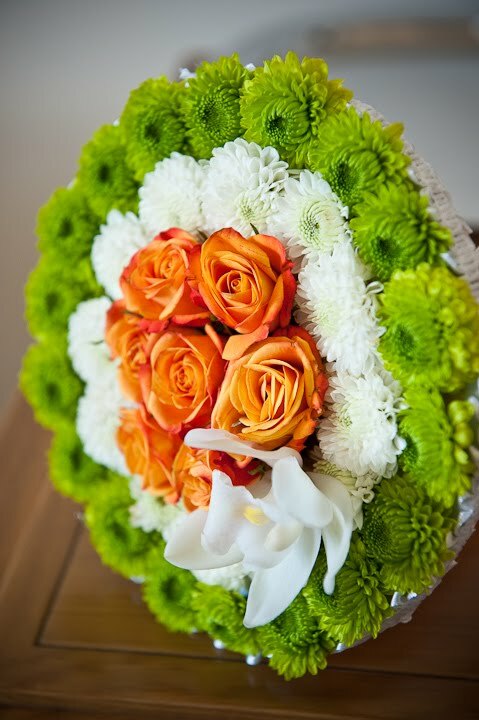 For example, the personal flowers for the maids were made out of circular disks which followed a detailed circular design completed with green and white mums and orange spray roses. The groom’s boutonniere was detailed with a square shaped wire treatment. Ceremony décor highlighted the consistent theme, with modern columns stacked high with white custom boxes filled with beautiful green mum floral spheres. What was really interesting about the significance behind the circle and square was not only in its representation of a mathematical conundrum but also it’s symbolic implication of unity. Research finds that the combination of a square and a circle denotes unity between heaven and earth. For our clients however, this was the unity of husband and wife. Go to http://www.shawnayamamoto.com/ to see more photos from this event!